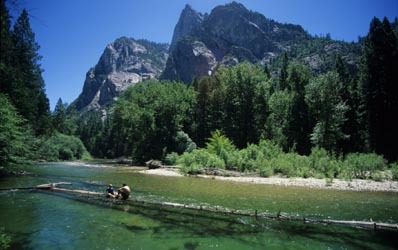 As it flows down into the foothills from its source high in the Sierra Nevada Mountain range, the Kings River winds its way through rolling hills dotted with pines and oaks native to Central California. Though the Banzai section is not known as a wilderness river or beloved for its isolation, you can expect moments of natural beauty and glimpses of wildlife along the riverbanks. While the Banzai run is the most popular for commercial rafting, there are numerous other sections that are more advanced including the Middle Kings, a multi-day Class V expedition kayak trip.